I have seen a few other post HA stuff for sale on here, so thought I would. If not OK, feel free to delete the post. Qty 5 - Ecobee Sensors ($20/ea). 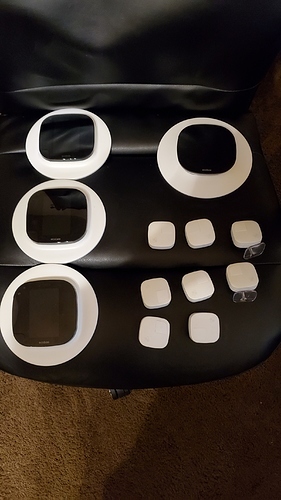 Note the 2 sensors pictured on the right with "stands" only have the "stand" backs, and do not have the original flat back. EDIT: I'm in San Antonio, TX USA, and only sell/ship to US addresses. I'm in San Antonio, TX USA. I guess I should have also stated that I only sell/ship to US addresses. Sorry about that!